Does your website is failing to rank in the Google? Well, that’s probably because your website is not properly optimized for search engines. So, to get a higher site ranking and improves your organisation’s deals online, the first thing is to lay your hands on the best SEO tool available. These tools are a boon for the SEO professionals as it makes their life much easier and take the business to a new level of success. So, given below is the list, check out these 10 best SEO tools software and select the best one for your company. If you are looking for the most user friendly and efficient SEO tool, then AoRank is a must-have one. Within a year of coming into the market, this tool has developed a lot to be one of the most accepted SEO analyzers. As per user’s reports, it is completely safe to browse. Check out what makes the tool so efficient. Convenient reports: Reports by AORank includes headings, titles, keywords, size of page, time of loading, tips on speed, backlinks, technology, etc. Content Optimization: Helps in optimizing the content through consistency statistics and keyword cloud in report. Performance Improvement: Lets you improve your website’s performance through statistics on 404 error messages, loading speed, etc. 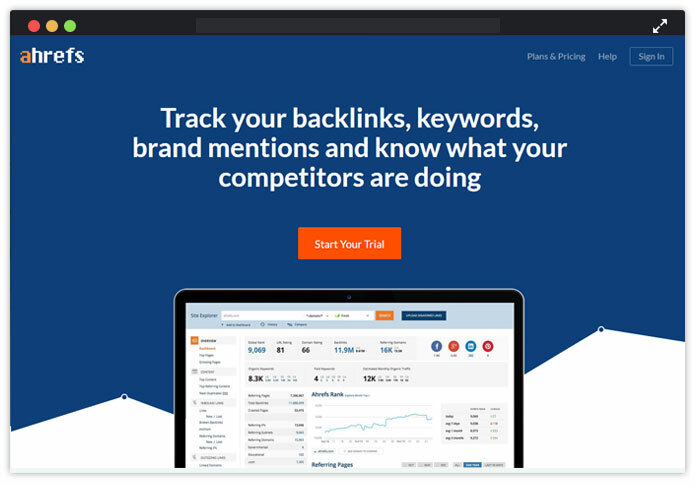 Competitor’s tool: Gives you reports on the technology and tools used by your competitors.. Popularity on social media: Know your competitor’s popularity of his blogs or website on social media (Facebook, twitter, and others)– lets you develop your content accordingly. Notification on upgradation: Identifies the faults in your website if any and notifies you where to improve and upgrade effectiveness. The AOrank is totally free. Well, if you want to create your own website and want to include the features of aorank then, you can purchase the script by paying one time. !! Yes you heard right.. No Recurring Charges. !! Rankedy is the most under-rated SEO Software on the internet, it is so powerful that even without the complex knowledge required to use SEO tools like Ahrefs or SEMRush, you can still accomplish most of those tasks in Rankedy’s SEO platform. You can seamlessly implement all relevant SEO strategies with the aid of the suggested improvements- keyword ideas, backlink monitoring, and topic orientation. The uniqueness of this software lies in its simplicity, affordability, and ease of use for both newbies and professionals alike. Is the fear of getting outranked by your competitors cutting short the joy you had when you boosted your ranks? With Rank Journal, you don’t need to bother about all this game anymore. This tool works like magic! It can guide you to outrank your competitors on SERP and also aid you to reclaim your position in case you get outranked too. How does it do this? It spies on your competitors and log all the changes they made to rank high. You are alerted once you get outranked or a rank change happens- you can check what they did and easily do the same for your site to reclaim your position. I told you it is magical, didn’t I? Have you ever wondered why your competitors always outrank you on SERP even for the keywords you want to rank for? Good news is that, you can copy their keywords pattern using the Keyword Personality to be at par with them. Do you want to beat them? With Keyword Opportunities feature, you can see the trending keywords in your niche that you can use at the right time to rank high, and the Related Keywords feature to generate semantically related keywords you can use to spice up your content to further expand and furnish your keyword optimization. Are you writing on the kind of topics that resonate well with your target audience, same thing your competitors are presently doing to rank high? How do you know this? You can amazingly do this by spying on your competitors using the Topic Orientation tool. 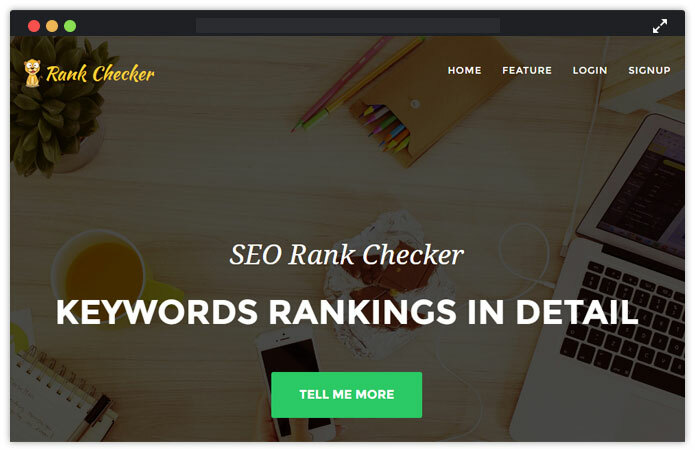 This tool find the topics related to your website based on your keywords,and compare them against the topics of the top 100 competitors ranking high on Google SERP. It then shows you the orientation level, that is, the similarities between your content and the content of your highly ranked competitors. Armed with this information, you will be able to properly optimize your content and boost ranking. After all your SEO efforts, you need to track how well your keywords rank on SERP for mobile, desktop and live searches across 237 countries. Hence, the SERP Rank Tracker feature gives you a real-time notification on your rank status and actionable improvement tips in case of any fluctuation. So, there is no risk of losing your rank while you are busy with other things. Analyzing your site pages individually and generating a report for each page can be time-consuming and too bulky for you to process. But, Page Analysis feature scans all your site pages thoroughly at once for possible areas that can be optimized using its 14 checkpoints as a standard- including, duplicate & thin content, harmful backlinks, missing H1 & H2 tags, readability, rich snippets, etc.- and generate one result for this analysis pointing to the exact place that needs to be fixed and how to fix it. You no longer have to do the tedious work of a detective, manually sniffing for errors on your pages. Domain Analysis automates all the tasks you usually carry out manually using other dedicated tools to boost SEO. With this cool feature, you can now easily gain insight on the little SEO practices (like, AMP, Mobile optimized, SSL certificate, HTTP to HTTPS redirect, Site map, compression enabled, etc.) that are often ignored, and tips on how to fix them. If you are unable to implement these changes by yourself, there are experts on the ground in Rankedy that will perfectly handle them at no cost. Time-saving! Think about this, how will you feel when you get information on the changes your competitors made to their backend? Super happy, right? Okay, not just that, it also tracks how the changes were made and the resulting effect it had on their SEO. We do the work, you no longer need an insider to get this valuable information! Rankedy’s Tech Footprints tool constantly analyzes your technical footprint (backend features) against best practices as prescribed by Google to rank high (user’s experience) and notifies you of the improvements your competitors are making on the backend. It’s true that you can’t compete against all your competitors at the same time, in fact, that can not be effective. But, you can compete with the right competitors, beat them hands-down, and then select another group of competitors to compete with, repeating the cycle. Rankedy’s Competition Landscape helps you find the right segment of competitors to target and copy their strategies, using its superb AI. I bet you know how much this feature will save for you instead of hiring an SEO consultant for competition analysis? Cool! Monitoring your backlinks is now made easy, showing how many links you gained and lost. Also, this feature keeps track of the links you lost and where they are located so that you can easily identify and get them back seamlessly. Your site can go down anytime without you being aware at all, a very bad occurrence for SEO that can happen to any site This gives a lot of people headache. You can effectively and constantly monitor the uptime of your site with this tool and get notified immediately any downtime is detected. Now that you already know the number of links you are gaining and losing, what about, getting this kind of information about your competitors? It will show you how well you are performing and motivate you to do more in terms of backlink building. You get to see where your competitors’ links are coming from, the total number of links gained and lost, and the kind of content being linked to on their site information you can incorporate into your strategy to earn more links too. Free trial: Do you want to test the waters before getting in? Fortunately, you can test Rankedy with full access to the freelancer plan for 14 days without credit card details. You also get 10% off when you decide to continue the subscription. Cool deal! Paid plan: Rankedy has various plans tailored to suit the purpose for which you need it- either as a freelancer or as an agency. The various plans prices range from $29 monthly for freelancers, $79 monthly for startups, $149 monthly for agencies, and a custom plan for enterprises. Opting for the yearly plan will only require you to pay for 10 months- that is, you get 2 months paid off. Bonus plan: You can also be one of the early buyers of the lifetime account validity plan for just $295. Buying this lifetime plan will give you unlimited access to all of the features including future upgrades that will be made, without requiring any extra payment from you. Be among the first 1000 subscribers to make this purchase or the price might just increase. That’s a tip-off from me. 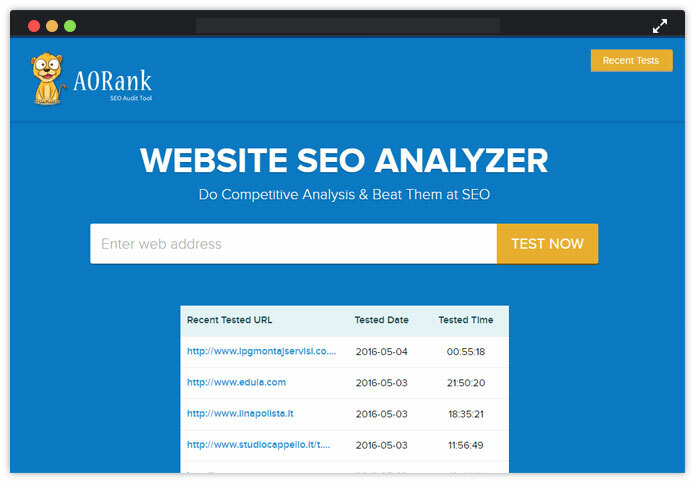 Another tool for checking the page and alexa rank by submitting the website URL is Rank Checker Tool. It has lot of interesting features that make it outstanding among other SEO tools. Get all the website stats and keyword ranking within a single click. Track all the website pages and keywords and check it on a graph. Get an automatic email when the ranking of your keyword get changed. The Rank Checker is totally free. Well, if you want to create your own tool like this, just purchase the script by paying one time. No Recurring Charges. !! One of the best keyword research tool that is capable of generating more than 1000 suggestions for a single term. It uses “Google Autocomplete” for suggesting those keywords that people search in the Google search box. The tool also helps in finding the keywords that are hidden in the google keyword planner. Generates accurate keyword for advertisements campaigns like PPC, CTR, and CPC. Export all data to CSV file. Generate keyword double than free version– more than 1500 from Bing, YouTube, Google, App store and Amazon. Monitor Google AdWords competition level. Generate suggestive bids on Google AdWords. Perfect tool for International SEO as it is availbale in 83 languages. 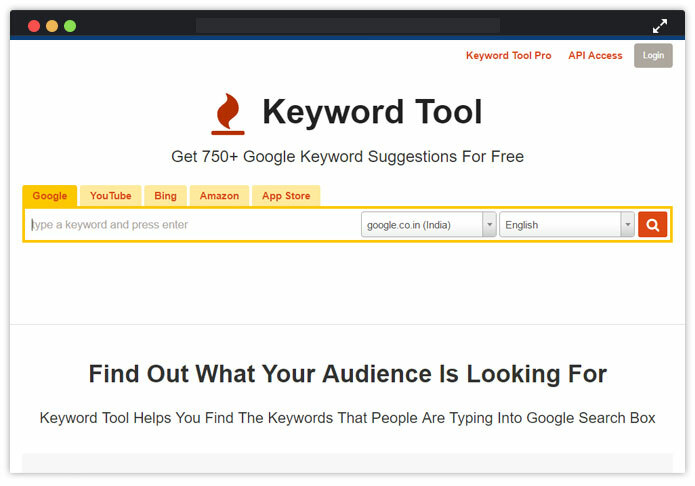 Free Trial – The free version of Keyword Tool is easy to avail. You don’t have to create any account for that. It suggests 750 relevant keywords. Paid Plans – If you want to purchase Keyword Tool Pro, there are three packages that you can avail, Pro Plus, Pro Basic, Pro Lite – where monthly subscription is started from $88 and yearly subscription is from $845. 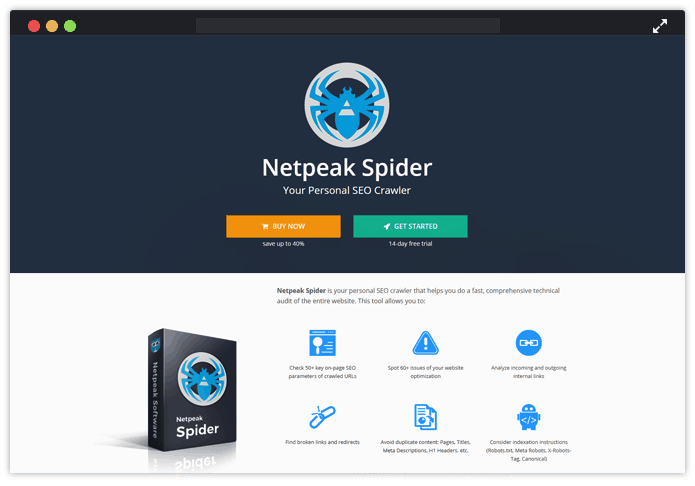 You can try a14-day free trial with full access to the Netpeak Spider. 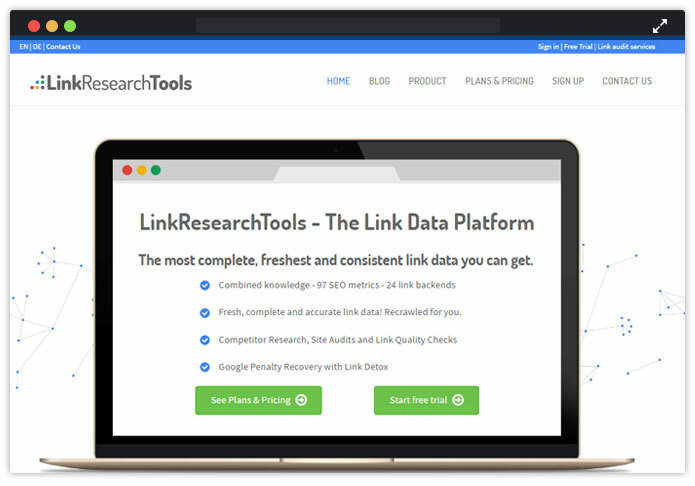 Here comes one of the accurate link data platforms – LinkResearch Tools. Data from 24 link backends like Google Analytics, MagesticSEO, SEMRush, Facebook, Twitter, etc. Analysis link by 97 SEO metrics like Trust, Power, Buzz, etc. Removes Google Penalty using Link Detox. Uses Link Detox Boost to recrawl disavow file faster. Compares with 10 competitor domains to track link growth. Provides all contact data of your required domains. Link Check Tool and Link Alerts sends notification on new links or changes via e-mail. Free Trial – Here you get a free trial of 7 days that will be expire automatically in a week. Paid Plan – The tool has different plans say Agency, Superhero, Expert, Starter which include different pricing starting from €149/ month to €1799 / month. Choose one as per your need. The speciality of Ahrefs is – it uses exceptional tools to monitor brand mentions, backlinks, and keywords. It lets you track the work of your competitors and helps to improve your performance more efficiently. Position Tracker: Shows where your keyword ranks in all countries and languages with both monthly/weekly ranking reports. Position Explorer: Discloses your competitor’s all keywords, and their complete status of ranking. Site Explorer: Explores a site and take out and an elaborate backlink profile of any website or URL. Ahrefs Alerts: Notifies every time when there is a change or new addition in your competitors’ backlink and track their sources. It also alerts who are talking about you and your online rivals. Content Explorer: Effective in creating a content strategy and link building campaign. The tool notifies about which content of yours is getting more shares and traffic. Crawl Report: Tracks and fixes any issues that may affect your website’s Google ranking. Free Plan – You can get a free trial of all premium features of Ahrefs for 14 days. Paid Plans – The tool consist of two types of plans Personal Plans and Agencies Plans and these plans again consist of different payment structure starting from $99/month to $2500/month. 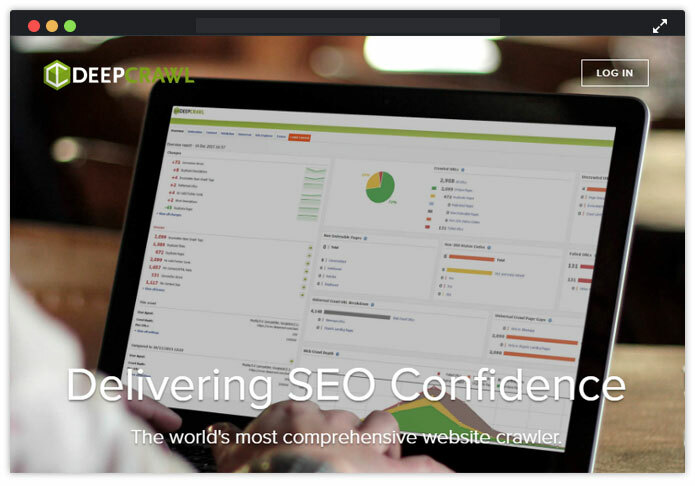 If you talk about the appropriate website crawling tool, DeepCrawl is an obvious mention. It has got recognition as the world’s most comprehensive crawler and allow you to compare your site with others and find more flexible ways to improve your website. With DeepCrawl, you can track the problematic URLs and prioritize your requirements easily in no time. Uses ‘site migration’ feature to recrawl the already crawled site. Checks whether the tags are linked correctly. Monitors the tags for international search in right language. Inspects if all redirects are authorized and expands crawling efficiency. With ‘Deep Rank’, it digs out prioritizing factors for your website. It has both “monthly” and “pay as you go” option starting with a price of $80/month up to $1750. Grab one of them as per your need. 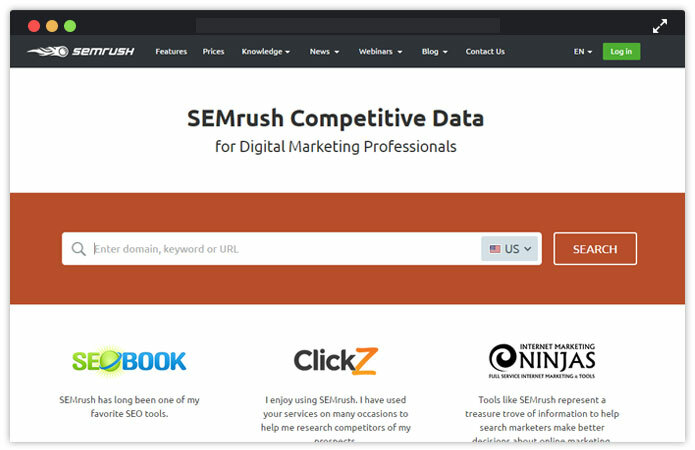 As you need an excellent SEO tool additionally with digital marketing feature, you cannot miss out SEMRush tool. It is ideal for middle sized and large enterprises and easy to determine difficulties in keywords and win the online race. You will get less critical search terms with only few clicks. Reveals advertisement strategies of your competitors in link building, display advertising, paid and organic search. Ideal for launching global campaigning projects with metrics regarding on-page health, keyword rankings and online rivals. Analyses their keywords and Ad copies through traffic, position, competition score, CPC,etc. Takes your advertisement campaigns to local level in 16 languages and 26 regions with SEM Advertising Research feature. Get your online rivals’ video advertisement strategies. Free trial – If you are a beginner, then you can try out the free trial package of the tool. Paid Plan – There are a few differences in the packages that differ in prices too. Starting from the Pro plan where you have to pay $69.95 monthly, ended with business plan where you will charge up to $5499.40 anually. 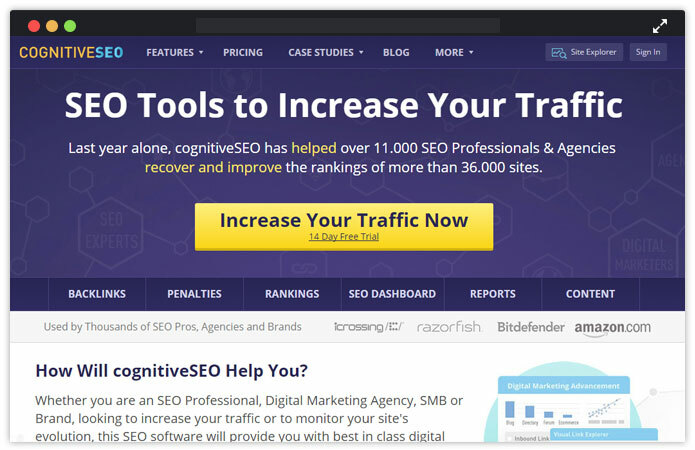 CognitiveSEO has all the reasons for being chosen as an effective SEO tool to increase website traffic. Once availed, it will provide you with exclusive analysis of business marketing strategy and more suggestive measures for your progress. Customizable SEO dashboard with 35+ metrics. The ‘link management tool’ automatically checks broken links. Backlink analysis and rank tracking for every site. With CognitiveSEO’s“Rank Tracker”, 10 keywords monitored daily for ‘Entry’ plan and 400 keyword for ‘Elite’ plan (covers both local and global). Free Trial – You can also avail the 14 days trial package and get a glimpse of how proficiently CognitiveSEO works. 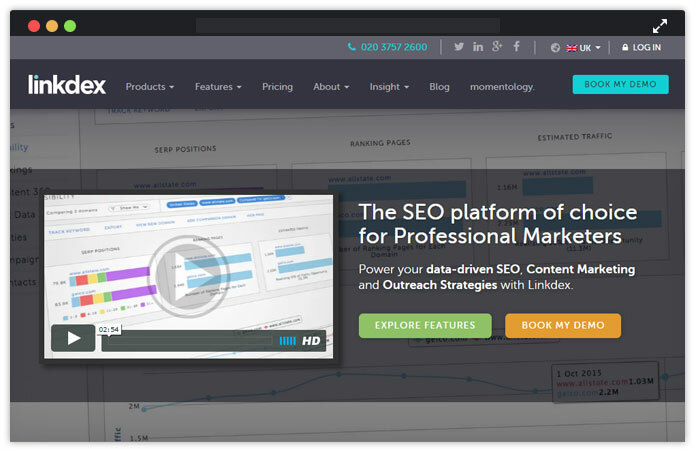 Linkdex is one of the most trusted and reliable SEO platforms for professional maketers. It has equal efficiency in flexible ranking, content strategy, technical SEO data with crawl analytics, link data assessment, and review quality links. Delivers well detailed reports in Excel or PDF formats for your personal master templates or slides. Extract click-and-go report elements with around 100 dimensions. Also apply SEO report dimensions like pages, keywords, time. Get newly added reporting components every month. Uniquely designed KPI generates visibility data, pages, and domainpromptly. Complex keyword filters for comparing KPIs on channels, categories, both counting and without branded traffic. Access to more than 100 million valuable keywords in the internet world. Helps you with insight product management. Manage your SEO activities and report on outreach campaigns. Helps enhance website performance with high impacts. Helps you find authors’ names of highly ranked contents. Let’s you include them in your outreach campaigning circle. You can build relationships with them, mostly prioritized by search engines. KPIs can be compared with both internal and external links, anchor text to match yours with market-leading contents. It has 3 plans Standard, Premium and Enterprise. The standard plan starts from £600/month, premium starts from £1500/month and enterprise starts from £6000/month. You must have heard about Raven Tools. If not, check out the amazing features. 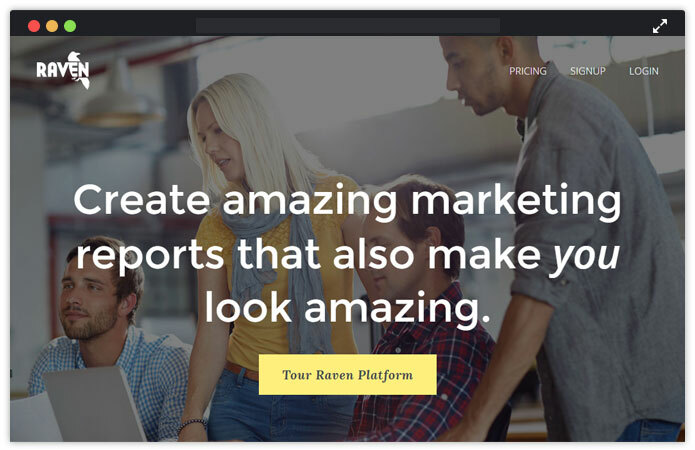 Raven Tools save your time in generating customised reports in minutes. It easily stores complete link building campaign in an organized manner for content outreach. It offers automated and interactive reports on marketing. Also, incorporate more than 20 data sources like Google Search Console. Site Auditor can automatically crawl websites for finding out technical SEO problems. It takes note on Google’s latest SEO needs to qualify a site’s ranking value. The software design is highly focused on research that makes this tool generate exact solutions and reports. Free Trial – Try out the 30 days Free and unlimited trial package to have an excellent experience of using Raven Tools. Paid Plans – It’s Pro plan is ideal for small agencies and marketing professionals where you have to pay – $99 / month and Agency plan charge $249/month that is ideal for both large groups and middle sized agencies. 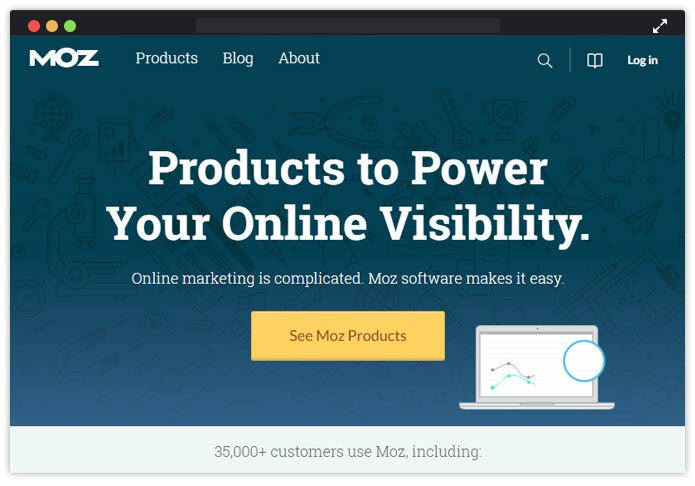 Another SEO software with exclusive metrics and features present is Moz. The software is also specialized in page optimization, reporting and workflow. Monitors keywords ranking in more than 200 countries on a weekly basis. Generates Search Visibility Score based on CTR (Click Through Rates) and positions. Monitors mobile friendly tags, makes a comparison of mobile and desktop ranks. Also, tracks keyword rankings at geographical levels – local or national. Exposes issues of duplicate content, broken links, missing pages or other crawl errors. Makes unlimited audits of public websites for around 1 million pages. Provides smart SERP analysis to track who’s ranking higher and why. Analyses keyword for effective keyword strategy with competitive keyword metrics. Free Trial – The tool offers you a 30 days trial for free with site explorer, internet explorer, etc. Different pricing plans are exist in this tool – standard, medium, large and premium. The standard plan starts from $99/month. Choose one as per your need. Hope you have found the above information helpful. All the SEO tools mentioned above are highly qualified in some way or the other. So, it’s up to you now to choose the one among these free and paid SEO tools that best suits your business needs. Tell me which tool you like the most in the comment section below.